Join the ranks of Degas, Van Gogh, and da Vinci in helping to perpetuate the virtually forgotten art of pencil drawing. 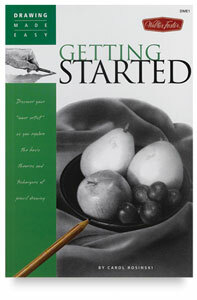 This inaugural title from Walter Foster’s Drawing Made Easy series introduces aspiring artists to the fundamentals of graphite drawing. In-depth information, including several approaches to the discipline, inspires beginners and helps them gain confidence in their own talents. Artist-author Carol Rosinski guides readers through the basics, starting with essential tools and techniques — from selecting erasers and paper surfaces to applying the graphite and rendering detail. Then she encourages them to apply their newfound knowledge by guiding them step by step to create fully rendered pencil drawings that include a landscape, an animal portrait, and a still life. From an early age, Carol Rosinski could pick up a pencil and transform paper and pencil into a living scene with depth and texture. Since 1985, Rosinski has worked exclusively with graphite pencil. She has been an artist and teacher for more than 20 years, working as an illustrator and showing her artwork in galleries. Her drawings have appeared in a number of publications.